Phil Chadwick's Art: #1997 "Forever In Time"
This is the seventh demonstration piece for the Southampton Art School's Wind Waves and Weather 2017. We had a full and eager list of participants. The fishing turtle-style boat “Just in Time” always seems to be in harbour. That was convenient as I needed to paint a different boat. I had a request to demonstrate another boat other than a sailing vessel. Other participants of Wind Waves and Weather shifted westward so I went west as well – go west old man, go west. 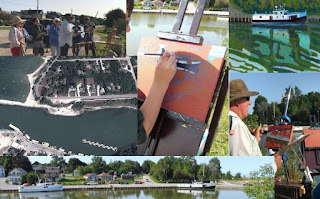 One very young participant and keen was painting the same fishing boat so I felt that it might be instructive and interesting to see what I would do with the identical scene. The onshore lake breeze was just starting to develop with the daytime heating inland so that the calm water and strong reflection were rippled during the painting of this scene.